The holiday season is here. Lots to do. Too little time. You’re wrapping gifts and preparing goodie bags with name tags. But you can’t find scissors, tape or stapler in the cluttered junk drawer. Next comes the frantic search around the house or unplanned trip to the store. That’ll probably waste an hour. 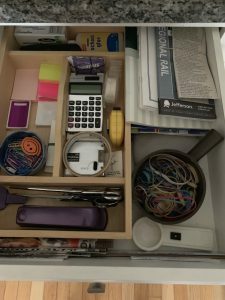 In a quarter of that time, you could organize the junk drawer. The ubiquitous junk drawer. We put things in there that we expect to need and easily find. Does yours work that way? If not, keep reading. Your drawer can look and function similar to mine (see photo). Little changes help to make life easier. Successfully completing a small organizing project may motivate you to try a little larger project, like a coat closet – just in time for holiday guests! As an organizing and productivity consultant since 2000, I help people lead more productive and fulfilling lives, at home and work, by teaching how to get and remain organized. As a home stager, I prepare homes for sale to sell quickly, for top dollar. Contact me for a free discovery call.